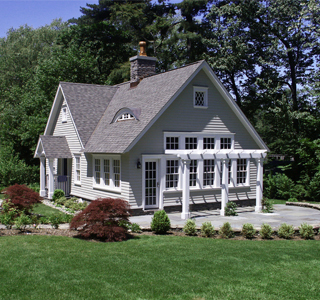 RHBPC designed a new guest house for the owner of an estate house in Scarsdale. RHBPC also completed renovations to the existing house, including a new family room, garage, and terrace addition. The new guest house was designed in the “cottage” style of the original estate house. Due to zoning restrictions, the new building was required to be constructed on the foundations of a pre-existing garage. This footprint was enhanced with unique features such as the central stone fireplace, vaulted, beadboard ceiling and sleeping loft.